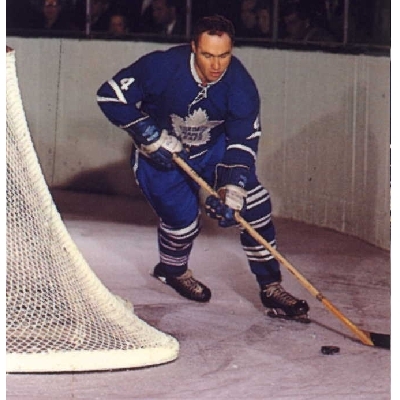 Red Kelly would likely have started his career in a Maple Leaf uniform, if not for a scout advising them that he would not last 20 games in the NHL. Toronto’s passing on Kelly gave Detroit a chance to nab the young defenseman. In 1954 he was the first recipient of the Norris Trophy (he might have won more had the award been created when he entered the league in 1947. He would play his first 12 seasons with the Red Wings. In that time he helped them win four Stanley Cups and eight regular season championships. After Kelly mistakenly told an interviewer that his ankle wasn’t 100%, Jack Adams got infuriated and traded him to New York. Kelly eventually persisted and landed in Toronto instead. The GM of the Maple Leafs at the time, Punch Imlach, decided to make Kelly a center. His fourth and final Lady Byng was won while he was a forward. In his first full season in a Leafs uniform, he scored 70 points, which was 16 more than his previous total (with six less games played). In his first three full seasons he surpassed 20 goals in each year, his highest goal totals in his areer. He played a total of eight seasons in Toronto, winning four additional Cups. His grand total of eight is the most Stanley Cups by a player that wasn’t part of the Montreal dynasties. He was named to the All-Star Team eight consecutive times from 1950 to 1957 (six times on the First Team). After retiring in 1967 following his eighth Stanley Cup, Kelly coached the Los Angeles Kings for two seasons. After that he coached the Pittsburgh Penguins for three seasons. Finally, he went on to coach the Leafs from 1973 to 1977. He was inducted into the Hall of Fame in 1969. Toronto would honor his number four (and Kelly himself) in 2006. If it wasn’t for Gretzky and Lemieux, Jean Beliveau would arguably be the greatest centerman the game has ever seen. He wasn’t just a great player either. He was a great captain and a great teammate. He played his first NHL game when he was 19, but didn’t fully make the transition until he was 22. At first he was not even interested in playing in the NHL. In his third season (second season playing all 70 games) Beliveau scored 47 goals and 88 points and finished best in the league for both categories. He would have won the Rocket Richard Trophy for most goals scored if Rocket Richard wasn’t his teammate and still playing. As a matter of fact, Beliveau scored nine more goals than Richard did that year. He also accumulated 143 penalty minutes that season, a total he would never come close to again in his career. Also in his third season he helped Montreal to win the first Stanley Cup in this dynasty. The Cup would remain in Montreal for the next four consecutive years. Beliveau scored a league leading 12 goals and 19 points in that playoff run. In 1965, he was awarded the Conn Smythe for his 16 point performance in 13 playoff games, helping the Canadiens win their first of back-to-back Cups. From 1965 to 1971, the Habs would win the Cup five out of six seasons, giving Beliveau a total of 10 Cups. And if 10 weren’t enough, he would later win seven more as an Executive from 1973 to 1993, giving him a grand total of 17 times. No person has ever had his name on the Cup 17 times. 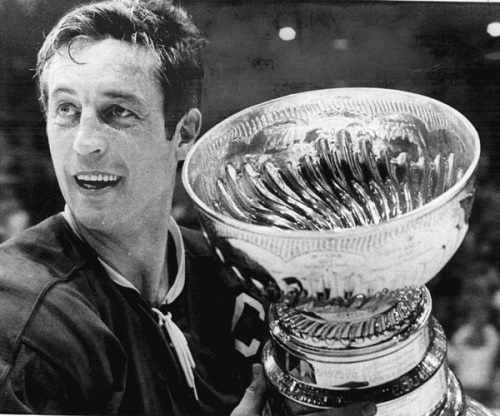 No captain ever had his name on the Cup more than Beliveau as well (five times). At the end of the 1969-70 season Beliveau wanted to retire. However, he stuck around for one more season to ease the transition of youth into the lineup. That final season he scored 25 goals and 76 points while playing in all 70 games. At 39 years old, he surpassed the 500 goal, 700 assist, and 1200 point plateaus. In the playoffs he recorded 6 goals and 16 assists (led all playoff scorers in assists) in 20 games while helping his team win one last Cup with him in the lineup. He scored 79 goals and 176 points in 162 career playoff games. He ranks 10th all-time in post-season goals and 14th all-time in post-season points. When the NHL started recording special teams stats in the 1963-64 season, Beliveau scored almost as many power play goals (13) as even strength goals (10). In total, he scored 63 power play goals compared to 134 even strength goals from 1963-1971. Only Guy Lafleur scored more assists and points than Beliveau did in his career. Lafleur’s first season was Beliveau’s first year of retirement. In addition to winning the Hart Trophy twice, he was named to the All-Star Team 10 times, with six being on the first team. His jersey number was retired in 1971 and he was inducted into the Hall of Fame in 1972. When Bobby Orr entered the league, it was easy to tell he was destined for greatness. In his rookie campaign he won the Calder Trophy, making him the youngest player to win a major award at the time. He won the Norris Trophy a total of eight times in his career which is one more than Doug Harvey and Nick Lidstrom had. More impressive than winning eight Norris Trophies is that he accomplished that record in eight consecutive years, taking complete ownership of the hardware. Orr was named league MVP three consecutive years from 1970-72. His point totals in those seasons were 120, 139, and 117 respectively. Keep in mind he was a defenseman, not a forward. The first of those totals won him the Art Ross Trophy for most points scored in the regular season. The second of those totals marked the highest point total he ever produced. 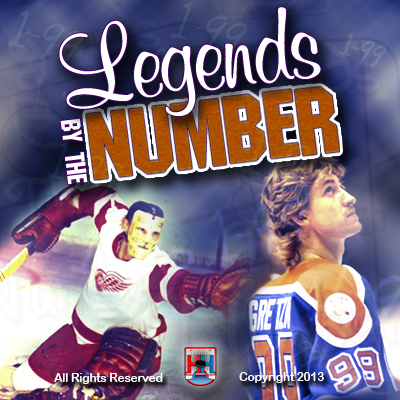 In fact, no defenseman in the history of the game has surpassed that point total in a single season. That year he was a +124. He led the league in assists five times (1970-72; 1974-75). His highest assist total was 102 in 1970-71. He never led in goals, although his highest goal total was an incredible 46 in 1974-75. 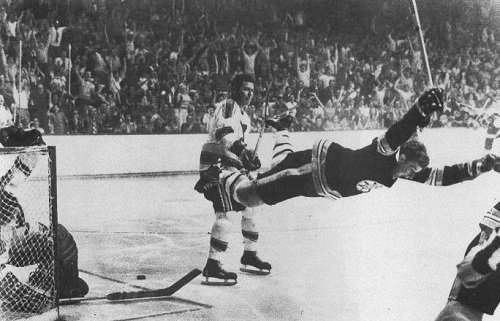 Orr helped the Bruins win the Stanley Cup in 1970 and 1972. In those two playoff runs combined, he notched 44 points in just 29 games played. He was named to the All-Star Team each season from 1967-75 (only the first of those seasons was on the Second Team). It is unlikely that there will ever be a defenseman as dominant as Orr in generations to come, since times coaching styles have gradually changed. He was known for charging down the ice with the puck and gracefully breaking in on the netminder. Most defensemen nowadays are taught to play it safe or risk giving up an odd-man rush. Orr was never afraid of that. If it ever did happen, he would make up for it with a lot more positives to outweigh the negative. If he lost the puck while charging the length of the ice, he would turn on the jets and immediately self-correct his error. He was a smooth skater and made playing hockey look effortless. Something unique about his playing style is that there is no close comparison to any current NHLer. He controlled games with his hockey IQ and wore down his opponents with his speed. Unfortunately, due to around 13-14 knee surgeries on his left knee, Orr’s career was ended way too early. After leaving Boston and signing a five-year contract in Chicago in 1976, he would only play 26 more games (all in the regular season) due to injury. He was forced to miss the entire 1977-78 season and his career was over before he turned 31 (after playing six games in 1978-79). In 657 career regular season games, Orr scored 270 goals and 915 points. He ranks 5th all-time in Bruins scoring (888 points – 10 points behind forward Rick Middleton with 250 less games played.) His +589 is far and away the team record for plus/minus. One can only imagine what else he could have accomplished if his career wasn’t cut short. Orr is arguably the best player to ever lace up his skates. Only Gretzky, Mario Lemieux, and Mike Bossy finished their careers with a higher points-per-game total than Orr. After retiring in 1979, he was immediately inducted into the Hall of Fame, after the three-year waiting period was waived. The Bruins retired his jersey number in the same year.